It’s been well-documented that illness is the leading cause of bankruptcy for the poor . 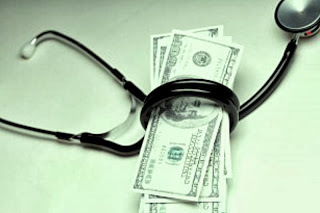 One never knows when a medical emergency will occur , and since most poor people who do not have the financial luxury of being able to buy health insurance , when illness strikes out of the blue , they are forced to pay medical bills which they just cannot afford. This often pushes a family which is living on the financial edge into the abyss of bankruptcy . Sadly, there is no public safety net in India , and because most patients perceive quite rightly that the quality of medical services within the government healthcare system is extremely poor, they are forced to resort to going to private hospitals and doctors. Since these are for-profit institutions, they will often do a lot of unnecessary procedures in order to maximize their revenue . This is especially true in an emergency situation , when the poor patient is scared and helpless and cannot think straight . He is scared witless , which is why he is forced to pretty much toe the medical line as laid down by the doctor and do what he commands. In this situation , many doctors try to maximize their revenue, and often do lots of tests and interventions which may not necessarily be in the patient’s best interests. In fact, poor patients cannot afford most of them , but most doctors take the attitude that it’s not their job to worry about the financial costs of medical care and that it’s the patient’s problem to raise the needed funds . Patients are forced to beg, borrow and steal - and this often forces these families into lifelong penury from which they cannot recover. They have to take a loan to pay the astronomical medical fees – and then pay exorbitant rates of interest in order to repay these emergency loans. This is story which is repeated countless time times throughout the country . One of the preventable reasons for this medical bankruptcy is the ethical bankruptcy on the part of doctors , who refuse to be empathetic and take responsibility for understanding the complete predicament of the patient , including his inability to pay . They do not bother to try to tailor the treatment , so that it becomes affordable and cost-effective for the patient. They blindly and slavishly follow hospital protocols and policies, which the poor patient simply cannot afford. Thus, if a patient had a stroke one day ago and is now brought to the hospital with the right half of his body paralysed, how will doing a CT scan help him ? However, not only will the neurologist order a CT, he will even do an MRI to confirm he has not missed a lesion ! While this maybe appropriate in a medical textbook, it makes no sense to do this for a poor patient in real life ! Medicine has always been considered to be a noble profession, but studies have shown that the healthcare industry is one of the most corrupt. The amounts involved are small, but the consequences are often lethal. Doctors assault the helpless and powerless patient with their expensive medical technology, irrespective of his ability to pay. They may do this with good intentions – but ignorance is not an excuse, and they cannot mindlessly treat every patient with the same protocol . They need to tailor it , according to the disease , and the amount the patient can afford to pay. Ironically, doctors can be extremely good at doing this - patients who have health insurance are often charged double the standard rate!